Morris Rosenthal runs Foner Books and is generally acknowledged as an expert in the self publishing world. He has been publishing online since 1995, and publishes eBooks without Digital Rights Management (DRM). He also gives away large amounts of his work on his website. However, despite his generosity in giving away information and even books for free, he is a strong advocate against copyright infringements and theft. Rampant copyright infringement is setting up the world for an Internet that will consist of nothing but product reviews, opinions and propaganda. I stopped publishing new works online this year, and I predict that most professional work will disappear behind firewalls. … and strongly criticises Google search for sending visitors to piracy sites rather than those of the originators of the content. This is how it works – a thief comes along and steals content from an author’s website, then they publish it on a large community site. The large community sites have no interest in policing copyright theft because they run advertisements on their sites. They use their size and influence to rank high in Google’s search results. Thus it often happens that the thief will rank higher than the originator. This often denies the original author a means to earn a return for his efforts. However, it creates a win-win situation for the thief and for the community site, and it’s not in the interest of Google to change how their search works because they’re all making money via Google’s advertising programmes. Only the author is the loser, by being deprived of the opportunity to be rewarded for his work. Having explained WHY it’s important for authors to defend their rights, Rosenthal moves swiftly on to tell us HOW. (There’s no fluff in this short book.) First, he starts with methods to enforce your rights as an author of copyrighted work. You need a systematic approach and for this you need some “enforcement tools” – he suggests some and explains them. Then you need to know how to locate where infringements of your work have occurred – also explained. And then he discusses the DMCA (Digital Millennium Copyright Act) dashboard and the weaknesses of trying to enforce your rights by using the DMCA system. The problem, he says, is not so much sharing and illegal copying. That’s always going to happen and is impossible to prevent. The problem is when the illegal copies are more easily found on the search engines than the legal ones are. Since Google is the biggest perpetrator of this injustice and cause of loss of sales, and sometimes impaired customer relations, for the original author, then the best solution is to use their tools to solve the problem. He explains how to do that, the techniques for doing it, and outlines some of the problems you might encounter while doing so. There’s also a bit of advanced advice for those who may wish to go further. Having discussed DMCA, he next looks at an alternative – “cease and desist” emails. Rosenthal then discusses which approach should be used for which particular situations and the pros and cons of each. Next comes a brief explanation of how copyright law works. Remember copyright infringement is a civil matter, not a criminal offence. And he raises the question of whether it makes good business sense to spend your time defending your intellectual property. If you depend on search traffic to help promote your books, not defending your website from plagiarism can eventually lead to its demotion in search rankings. However, even if you agree about building traffic by means other than search engines, the fact still remains that many people do still go straight to Google when they’re looking for something and if the thief’s site ranks higher than yours, there’s a good chance that this potentially deprives you of income from the sale of your own product. Next Rosenthal explains what to do if you find that your work has been copied and is being sold on Amazon – just email copyright@amazon.com. It seems so simple with hindsight! How many readers have wasted their time giving scathing reviews on the stolen product, and found it to be a totally futile activity? The next section covers more detail of copyright law, what you can and can’t do, and information about bringing a law suit. This relates to US law and applies to works which originated in the USA. If you want to read it, then go and buy the book! Rosenthal then argues that the DMCA law encourages piracy. Through protecting “innocent infringers”, the Digital Millennium Copyright Act has done more to encourage Internet piracy than the invention of the file server…. Perhaps, as many have argued, today’s Internet piracy is a disease of immaturity and poverty. But I think it’s more likely a symptom of the DMCA, which puts the burden of proof on the victim, over and over and over again, with no penalty or shame falling on the serial “innocent” infringer. A law that protects reckless and illegal behavior by businesses is a fair definition of a moral hazard. If Google didn’t index these piracy sites, the DMCA ensures that the other search engines would, and that many search users would defect to them. There follows some discussion of Google’s flawed algo, how there have been some major changes recently and about how all too often many innocent parties are hit when these changes are rolled out. Much of the problem, as Rosenthal sees it, is that Google profits from pirated content, and much of this is because of AdSense. It’s very easy to steal someone else’s work, stick some AdSense ads on it, get your site ranking higher than the originator’s, and rake in the money. Google profits from this too through the share they take of every advert click. Google should stop content thieves from being allowed to benefit from the AdSense programme. If Google removed the benefits they offer to the thieves, there would be no incentive for the thieves to continue with such activities. The book contains some examples of how genuinely innocent parties can fall into the traps set by the scammers. The generic term for these scams is PLR, Private Label Rights. The seller claims to have authored an acceptable eBook, one that won’t create a 100% return rate from angry customers, and then sells the rights to re-label that eBook to suckers who believe it’s a great way to get rich. Often, a turn-key website is sold along with the PLR eBook as a marketing platform. The recipe calls for adding paid links, waiting for search engines to send visitors, and going into the business of selling advertising and selling eBooks. Additionally, the victim may also be enticed into paying for an expensive link building campaign. Next, Rosenthal discusses Digital Rights Management (DRM) and the pros and cons of using it on your published work. Much of it depends on your targeted audience. Then follows some interesting information about the general dirty tricks some of the scammers get up to, such as including malware in “their” products based on the content they have stolen from you. This section contains a few eyebrow raisers. And more suggestions of how to spot instances where your content has been stolen. 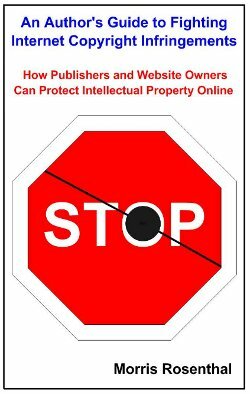 Morris Rosenthal concludes his book with encouragement to defend your intellectual property rights and make life a bit more difficult for the crooks. Every page you get knocked out of the search results for copyright infringement makes their business a little bit less profitable. All in all this was an excellent read. Short but full of information. I learned a lot from it. If you’ve had your work stolen I can think of no better place to find a simple, well-explained, systematic guide to dealing with the problem. It was written with considerable humour too, which made it entertaining as well as informative.